A well maintained garage door system is vital for ensuring user safety. While the springs, cables and panels are some of the more important parts that need regular upkeep, your automatic opener should not be neglected. This electro-mechanical device can experience a range of issues, and will need to be examined and repaired by a professional when that happens. Our technicians can quickly identify any problem you may be dealing with and promptly fix it. Whether it's a worn motor gear, a problem with the belt, screw or chain drive, or a fried circuit board, you can count on us to find the perfect solution. 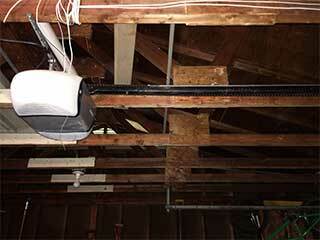 Very few people fully understand the many dangers that your garage door system can pose. The panels, after all, can weigh more than two hundred pounds. That's why there are certain things that need to be checked on a regular basis, to make sure the system remains safe to use. An example of this is being aware of the photoelectric sensors that cause the door to reverse when something gets in its way. Their alignment must be exact and their lenses must be clean and unscratched. As part of our regular opener maintenance, our technicians will examine these units and make sure that they're positioned and functioning correctly. Many modern garage door opener models can now come with back up batteries which will make it possible for you to keep using the device during a power outage. Let's face it, being caught outside on a dark, stormy night is scary, and can be dangerous too. If you have this feature installed you'll have enough power to not only safely enter your garage, but to also get out of it in case of an emergency. This is one of the different features that are worth investing in when getting a new garage door opener installed. Another useful one is Smartphone compatibility, which will essentially allow you to transform your phone to a remote control. To make sure you're not neglecting to consider anything, our experts will happily advise you on the different options that we have available and then take care of the opener installation process once you've made your choice. Our friendly team at Garage Door Repair Forest Park is available today for all of your opener related needs. Don't hesitate to reach out to us and let us take care of whatever you need. Our team is highly skilled at providing excellent solutions for all types of garage door problems, from broken torsion springs to malfunctioning openers. Our technicians offer fast, reliable repairs, maintenance and installation services. Feel free to browse our site for more information, or simply contact us today to schedule an appointment. Thank you for choosing Garage Door Repair Forest Park! One of our experts will be in touch soon. Feel free to browse our website for FAQ, tips and more useful information in the meantime!